Saudi Arabia issued an outright ban against watching the Al Jazeera TV channels on Thursday, in the latest bizarre twist in its on-going diplomatic spat with Qatar. 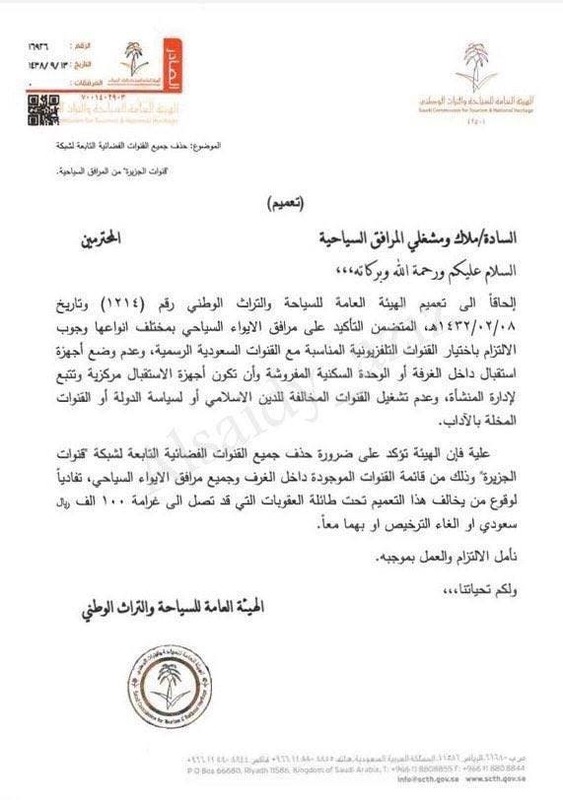 The Saudi commission for tourism and national heritage issued a warning of a 10,000 riyals ($2,700) fine if any tourist outlet failed to censor the Qatari news channel. "The commission affirms the necessity to cancel a number of Al Jazeera media channels inside tourism accommodation," the unsigned letter reads. The letter references law 1214, dated 13 January 2011, related to television transmissions. Saudi Arabia is currently engaged in a diplomatic row with Qatar over its financial support for 'terrorism' and 'terrorists groups'. Many analysts believe the incident and the campaign that followed were planned in advance, to justify the current blockade on Qatar and force a major policy change from Doha. Saudi Arabia, the UAE, Bahrain and Egypt, the engineers of the blockade, have spared no means in the current diplomatic and media war on Qatar: expulsion of diplomats and ordinary citizens, the blocking of airspace, severing of marine and land routes, and even a banking and postal embargo. Together with Egypt, Saudi Arabia and the UAE have blocked several Qatari-supported and independent television channels and websites. The UAE and Bahrain have even criminalised expression of sympathy with Qatar. The measures by the Saudi-Emirati camp against Qatar are proving unpopular within a large segment of the Gulf public opinion. Hashtags in solidarity with Qatar have been trending this week, all the way from Mauritania and Turkey (#Qatar_Is_Not_Alone), to Saudi Arabia and the rest of the Gulf (#We_Are_All_Tamim_Bin_Hamad). A Twitter robot army, linked previously to Saudi Arabia and Bahrain, has been deployed to quickly contain and steer such narratives on Twitter. Editor's note: Article has been slightly edited from its source material.